Having a successful skip hire company can equal to successful waste management. When you are able to manage the waste successfully, you are able to live healthily and happily. Environmental hazards also fall when we contribute to a cleaner and waste-free surroundings and it ultimately leads to a happier world. Successful waste management is not only targeted at cleansing and the removal waste and garbage in and around your area, but to also to ensure that the waste is utilised properly for recycling purposes. Some waste can be used for environment-friendly use like composting, energy production and many more. The waste production quantity in the UK is very large, so the management needs to be able to match it, so that there is no risk to either the environment and the living beings that reside in it. When it comes to waste management, nothing can beat the use of skips for the purpose. The skip hire company (or companies) in every area ensures that the waste is not only collected but also treated efficiently. This is one of the most important factors that contributes to the successful execution of the skip hiring process. The waste quantity must be considered well before asking for the skip hire because a large-sized skip is not needed for a smaller waste quantity. Also, a small-sized skip won’t be enough to accommodate larger quantities of waste. The skip sizes that are available are small, medium and large depending upon the clients’ requirements. Normally the domestic waste removal process is carried out by the small skip sizes which usually consists of yard cuttings, kitchen wastes, etc. And the medium or large-sized skips are generally used for commercial waste management purposes. There are certain guidelines that the skip hire companies are instructed to follow by the governing bodies which they have to stick to it under all circumstances. Some of the guidelines include not filling the skips entirely even if it means the entire waste won’t be cleared right away as it might be unsafe in an advanced stage. And other such guidelines are stated by the official to ensure the process is executed safely. It is indeed a big deal to hire skips on a consistent basis as the waste never fails to get accumulated around us. As the waste cleaning process carries on constantly, it might be an expensive affair too! So, it’s recommended to look out for cheap skip hire to any extent possible. You might contact your friends and family for references of any such skip company so that the waste management cost is cut done by a bit. We cannot avoid the expenses entirely so the only solution we have is to bring it down as much as possible. A successful skip hire leads to a successful waste management technique and successful waste management means handling the waste in the correct manner by recycling and therefore subjecting it to reusing and other utilities. So, when you hire the skip services make sure you know where they are taking your wastes. You should not allow them to clean the wastes if they just want to take it away from you and dump it again in some other dump yard. Acquire knowledge of where the wastes are going and how it is getting treated before zeroing-in on the skip hire services. You must know that the skips don’t come and go according to your will. There might be a scarcity sometimes or non-availability of the right kind of skip needed for your requirements. So, it’s not mandatory that you will always get the choice and requirements of skips whenever you want, sometimes even if you pay more for it. So, book the skip services beforehand for preventing any such possibilities and thereby keeping your environments and surroundings clean all throughout. 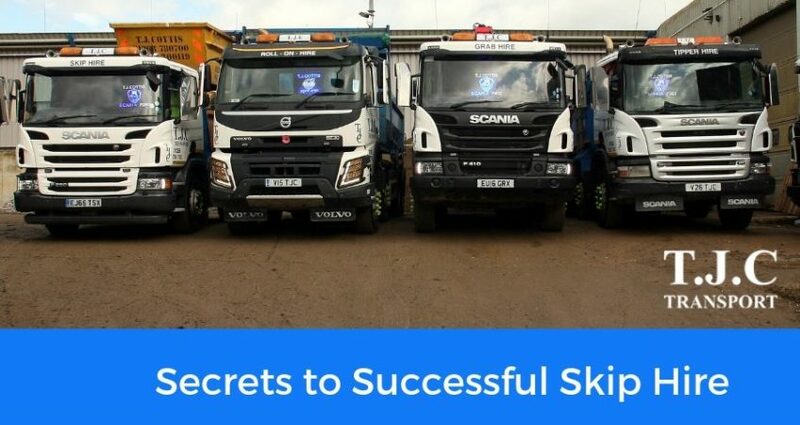 These are some of the secrets to successful hiring of the skip services. The skip hire Essex looks to the fact these conditions are met entirely and they can come to the help of the citizens of the UK at any time they want. This makes them the best of waste managers in and around the area. After all being able to contribute towards a cleaner and healthier environment is a chance not all get and when they can do this, why not take the opportunity! The cleaner the surroundings the better is the health of all of us.